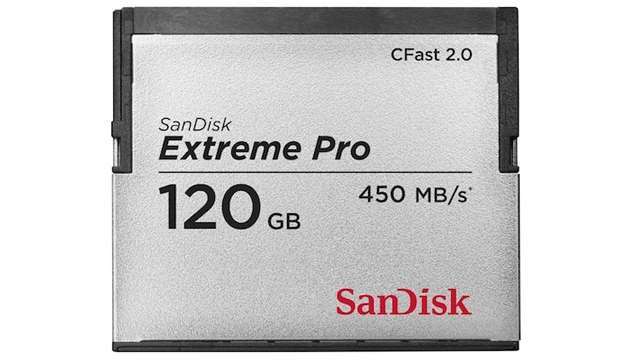 SanDisk has announced its new Extreme Pro CFast 2.0 memory card, which is the fastest around with 450MB/s read speeds, and 350MB/s write, you can transfer a 100GB file in just four minutes. The memory card has a capacity of 120GB. In practice, it essentially means up to double the shot speed of today’s fastest cards. Industry professionals can also manage large files faster than before. Extreme Pro CFast 2.0 primarily aimed at professionals in the broadcast, cinematography and next-generation professional photography industries. The SanDisk Extreme Pro CFast card is the first to utilise the CFast 2.0 specification, which was a collaboration of leading CompactFlash Association members. Early adopters and endorsers include SanDisk, Canon, ARRI and Codex. Motion picture equipment manufacturer Arri will be the first to implement CFast 2.0 as recording media in a camera. The new documentary-style Arri Amira will record to in-camera CFast 2.0 cards, and Alexa XT camera users will be able to use a new CFast 2.0 adapter, allowing it, as well as Alexa Classic cameras upgraded with the XR Module, to do the same. According to SanDisk, the Extreme Pro CFast 2.0 cards are created to withstand real-world exposure to temperature, shock and vibration,” and use a pinless design, which should reduce wear and damage from frequent card changes. The cards will also be marked with a unique individual serialisation number that can be registered into SanDisk Pro Care Customer Support. Right now, the Extreme Pro CFast 2.0 memory cards are only available in the US and Europe at select specialty stores. The CFast 2.0 memory card is available in 60GB or 120GB.